About 2.5 million scientific journal articles are published annually, and the growth of social media and online news outlets have given scientists powerful ways to share their findings – so much so that new measures are being developed to help capture the impact these outlets have on scientific work. 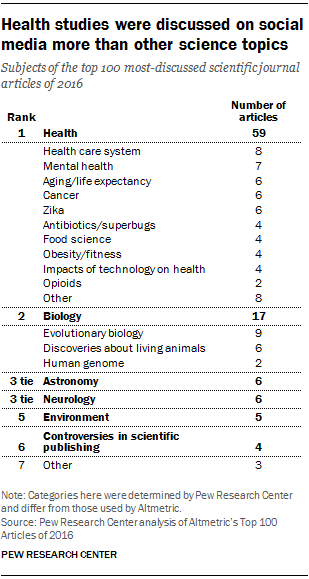 A Pew Research Center analysis of the top 100 most-discussed scientific journal articles of 2016 shows that the science articles getting news and social media attention stretched across multiple fields. Health care policy, space and evolution led the way. This analysis is based on data produced by Altmetric to capture the reach of scientific journal articles in online news outlets, social media and other online platforms. Articles are ranked according to their “Altmetric Attention Score,” a weighted average of the number of times the article was mentioned across a pool of more than 2,000 English and non-English global news outlets, blogs, Twitter posts and other online platforms. Scientific articles with a high attention score are studies that captured the public’s attention in some way. 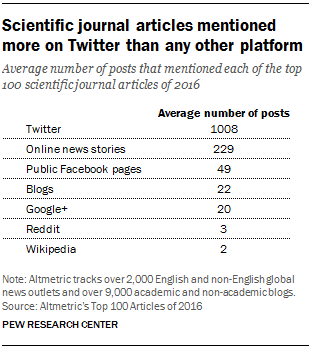 On average, each of the top 100 scientific articles appeared on 229 news outlets tracked by Altmetric, along with 49 public Facebook pages, 22 blogs and about 1,000 tweets. On average, few of these articles appeared on Reddit (average of 3 posts) or Wikipedia (2 posts). The article with the widest reach in 2016 was not a traditional scientific study, but was instead a paper written by President Obama regarding the status of the Affordable Care Act for the Journal of the American Medical Association (JAMA). The wide reach of the article is no doubt linked with its author and the controversial nature of the subject. A recent Pew Research Center survey found that 35% of Americans think passage of the Affordable Care Act (colloquially known as Obamacare) will be the most remembered act of his presidency, far ahead of other milestones. The survey also found that the public is evenly divided among those who approve and disapprove of the law. Obama’s piece, titled “United States Health Care Reform: Progress to Date and Next Steps,” was the first academic paper published by a sitting president. It was featured in 315 news stories and nearly 9,000 tweets. Altmetric calculated its’ attention score as 8,063 – some 64% greater than the next-most-discussed story. The article was covered by many traditional news outlets, including NPR and Bloomberg. Most of that attention was focused on Obama’s call for a “public option” insurance plan – an idea that was part of the original proposal in 2009, but was removed before passage of the bill. In general, health-related studies, even beyond the Obamacare article, had more reach on social media and other online platforms than other scientific studies. 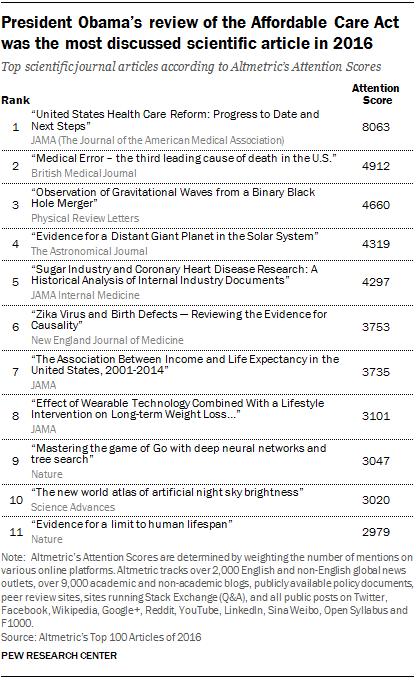 Seven of the top 11 most-discussed scientific studies for the year focused on health, as did fully 59 of the top 100. Together, these studies covered a wide spectrum of health-related subjects. The second-most-discussed health article after the one by Obama was about the prevalence of hospital medical errors, a problem the authors determined was the third leading cause of death in the U.S. The fifth ranked article was a historical analysis claiming the sugar industry had sponsored research dating back to the 1950s aimed at downplaying the possible links between sucrose and coronary heart disease. Publications about the Zika virus also were widely discussed in 2016 — six studies on the topic are in the top 100, including one ranked as the sixth-most-discussed scientific journal article of the year. That study, showing a relationship between Zika and birth defects, was the subject of more than 500 news articles and was mentioned in more than 1,500 tweets. Other widely discussed scientific articles on health topics include a study showing a link between income and mortality rates (seventh-most-discussed), a study on whether genetic factors constrain the human lifespan (11th-most-discussed), and a two-year study finding that despite the growing popularity of wearable technology, people wearing a fitness tracker were no more likely than those in a standard intervention program to lose weight (eighth-most-discussed article of the year). Beyond health-related studies, discoveries about outer space also captured wide interest online in 2016. The No. 3 most-discussed article reported the existence of gravitational waves, a phenomenon observed when two distant black holes collided. The existence of these waves was first theorized by Albert Einstein in 1916, but concrete evidence had not been discovered until now. The fourth was an article suggesting the size of the solar system was much larger than previously thought. And, the tenth-most-discussed article reported on the creation of a new world atlas using satellite data to quantify global light pollution. Only one of the top 10 scientific publications of 2016 — about a new development in artificial intelligence and neural networks — fell outside the topics of health or astronomy. The ninth-most-discussed article of the year reported the first ever computer algorithm able to defeat a human professional player at the game Go. Among scientific studies outside the top 10 that captured wide audiences this year were ones reporting new developments in evolutionary biology. A study published in Proceedings of the National Academy of Sciences (PNAS) suggested that dinosaurs were in decline long before a meteorite struck was the 50th-most-discussed article. Ranking 77th was a piece in Nature claiming that “Lucy,” the name of skeletal remains of an early human ancestor that lived 3.18 million years ago, likely died by falling from a tree. Note: Altmetric’s top 100 list is based on the rankings of their Altmetric Attention Scores which are determined by weighting the number of mentions on various online platforms. Altmetric tracks over 2,000 English and non-English global news outlets, over 9,000 academic and non-academic blogs, publicly available policy documents, peer review sites, sites running Stack Exchange (Q&A), and all public posts on Twitter, Facebook, Wikipedia, Google+, Reddit, YouTube, LinkedIn, Sina Weibo, Open Syllabus and F1000. Their rankings involve data compiled through Nov. 15, 2016. Since attention scores are calculated based on real-time mentions, the specific scores on Altmetric’s site may fluctuate. The above report is based on scores collected by Pew Research Center on Dec. 13, 2016.